~ In other news, Madonna's new buddies Timbaland & Justin Timberlake were spotted in London yesterday, so the video shoot is indeed happening this week. Next week, Madonna will be back in NYC to host the Gucci fundraising event. Weeks before the release of Madonna's new studio album, Mad-Eyes has surveyed its visitors on their favorite Madonna album. Disco album Confessions On A Dance Floor and 10 year old Electronica album Ray Of Light took the lead, together representing more than half of the votes. Third place went to Erotica (11%), closely followed by Like A Prayer (10%) and American Life (9%). We're curious how the new album will shake up this ranking! Check the poll results here. Our current poll wants to know what you think Madonna should do in 2008; cast your vote now! 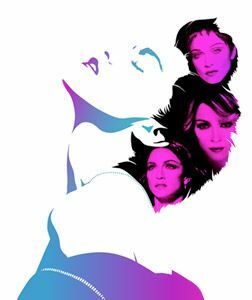 Madonna, together with Marilyn Monroe and Shakira, will front the first global advertising campaign for Sunsilk. The campaign aims to convince twenty-something girls around the world that "Life Can't Wait". Due to launch during the American Super Bowl on February 3rd, the Life Can't Wait campaign aims to encourage women to live their lives to the full by making the most of every minute. The new Sunsilk campaign tells each icon's unique story through the lens of their changing hair - each look inspiring a new chapter in their lives, revealing the power of hair as a tool of self-expression. Fansite Drownedmadonna reports that Madonna is going to premiere her directorial debut Filth And Wisdom on February 13th at the Berlinare Film Festival. Madonna is going to be there with Gogol Bordello's Eugene Hutz, the star of the movie. An afterparty will follow at the Bangaluu Club. Madonna has topped Hello! magazine's list of "The Most Elegant Woman." The troubled singer took top spot with a well over a third of the 61,800 votes cast, reports the mag. Hello! stated that the singer's "finely toned body that helps her carry off the freshest styles" was what vaulted her to the numero uno spot. Coming in at second place on the list was new mum Christina Aguilera for turning "every appearance into a show of A-list maternity fashion." Third spot went to Sarah Michelle Gellar for a "look all about easy glamour." Fansite Drownedmadonna is now reporting that the new album (still with the working title 'Give It To Me') is tentatively scheduled for April 11th (15th in the US), while the new single 4 Minutes To Save The World will be available in March. A hair-care brand is hoping to generate some attention through a worldwide campaign that gets under way with a star-filled commercial during Super Bowl XLII on Fox on Feb. 3. The commercial will present three famous, fabulous females - Madonna, Marilyn Monroe and Shakira - to promote the Sunsilk line of hair products sold by Unilever. The 30-second spot is scheduled for the fourth quarter of the game. Unilever has capitalized on the female viewership during previous Super Bowls, advertising its Dove brand of skin- and hair-care products. Now it's time for Sunsilk, which the company brought out in the United States in mid-2006, 50 years after it was introduced in its first market, the Netherlands. "We felt like a campaign of this magnitude deserved a very big stage," Sarah Jensen, marketing director at the Unilever hair-care division in Chicago, said Monday. The campaign carries the theme "Life can't wait" and urges women to "make your hair happen." The commercial will direct viewers to a Web site (lifecantwait.com), which is scheduled to go live on Feb. 1. Visitors to the site will be asked to share personal stories about how they - like Madonna, Monroe and Shakira - try to live life to the fullest. Or, in the case of Monroe, who died in 1962, lived life to the fullest. The commercial features snippets of songs associated with each star. Madonna sings Ray Of Light, Monroe sings "I Want to Be Loved By You" and Shakira sings "Whenever, Wherever."